Believe it or not, I was a dedicated cotton socks hiker for a long time. I liked the extra texture of cotton, which kept my foot from slipping and sliding inside my shoes. Of course, I also loved the next-to-skin comfort of cotton. Then I got a pair of Smartwool socks as a gift. By that time in my life I was a bona-fide wool skeptic, convinced the stuff would always be hot, itchy, and uncomfortable. Wow, how times have changed! Nowadays whether you catch me on trail or off, you'll likely find me wearing not only Smartwool socks but also a Smartwool crew top and bottoms. Smartwool has updated their Ski Ultra Light to the 'PhD' version, which adds strategically-placed nylon and elastic panneling to better control moisture and abrasion resistance. 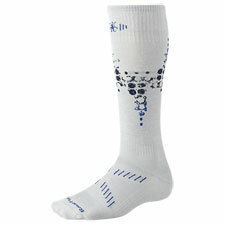 The original Ski Ultra Light was a great ski sock—absolutely sheer, with no unwanted padding. The PhD version, if anything, is even better, maintaining the best aspects of the original while improving in-the-field performance. If you're seeking an unpadded, ultralight-weight ski sock, I really don't think you can do better than these. This is the sock I use every single time I ski in the backcountry. I won't claim that they will magically cure all your blister problems...but if you're using a lesser sock, you'll certainly notice significant improvement in comfort when you hike and ski. Alpine Skiers may wish to consider Smartwool's 'PhD Ski Racer' series socks, which adds varying degrees of padding at the shin and heel by weight. For the backcountry, I like the sheerness of the Ultra Light—at least for milder temperatures. Remarkably, I haven't been able to kill a pair yet (though I do rotate through several pairs). Their durability has been outstanding. Highly Recommended!